On September 15, 1947, defendant Paul Blobel pleads not guilty during his arraignment at the Einsatzgruppen Trial. Blobel was the commander of the unit responsible for the massacre at Babi Yar (near Kiev). 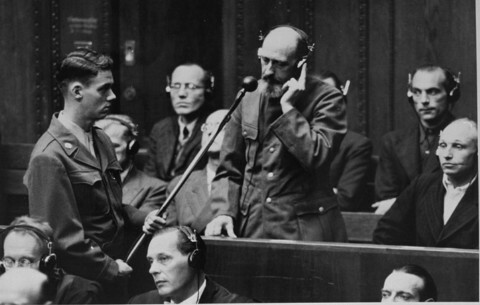 He was convicted by the military tribunal at Nuremberg and sentenced to death. Blobel was hanged at the Landsberg prison on June 8, 1951.